Photograph of the Webb family steam yacht Elfrida, with crew, docked at Quaker Smith Point at Shelburne Farms. In the background, the shore appears to be open fields with a few forested spots. 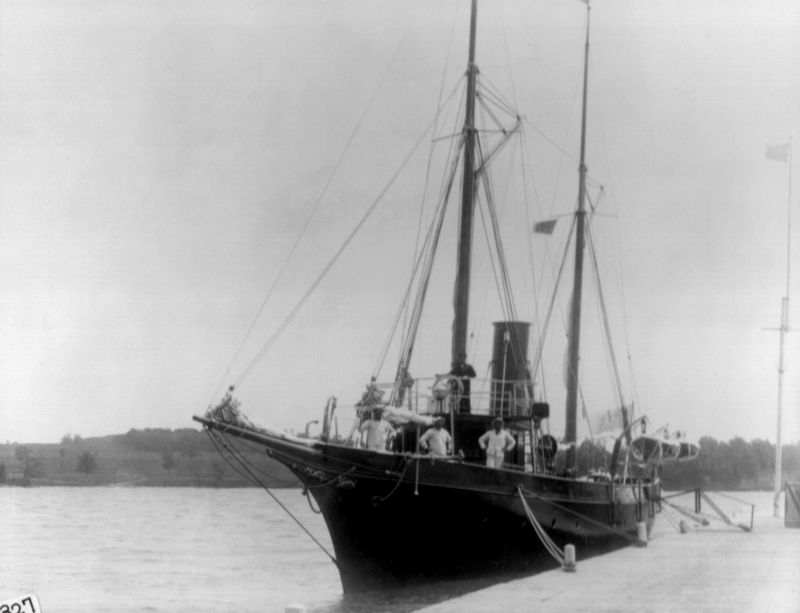 Julie Edwards (Shelburne Farms archivist) writes on 06-03-2008 that the image ( depicts Elfrida I, the darker hulled vessel and the image would date c. 1888-1898. 1888 Elfrida I built Dr. W. S. Webb contracted with Harlan and Hollingsworth Company of Wilmington, Delaware to build Elfrida for $100,000. June 15, 1898 The Elfrida, along with many other vessels, was sold by Dr. Webb to the Department of the Navy for $50,000. Following the passage of a bill appropriating $50,000,000 for national defense, the Department of the Navy purchased and chartered numerous vessels during the spring and summer of 1898. Image property of Shelburne Farms Collections. All rights reserved. May not be reproduced without permission. 1611 Harbor Road, Shelburne, VT 802 985 8929. Webbs acquired Shelburne Farms in 1886. Yacht was a popular passtime in the late 19th and early 20th centuries. Photo quality.